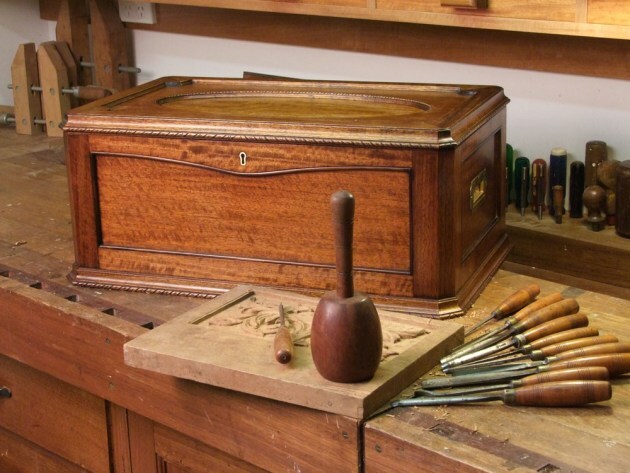 Above: The finished chest for carving tools contains dividers and storage for different tools. forward to completing but continually defer due to a host of more critical priorities. One such project for me has been a chest to store my carving tools. Since I bought my first carving chisel almost 20 years ago, I’ve been storing a growing collection of them in cardboard shoeboxes. Clearly they deserved better. to suit your specific needs. As such, fig.1 only provides general guidance on layout and I’ll concentrate more on the principles applied to constructing a project of this sort. My chest was designed to store chisels and knives in trays, whilst dividers provide dedicated internal spaces for strops, mallets and slipstones. Although I have accumulated around 50 carving chisels over the years I find myself doing 90% of my carving with no more than a dozen chisels so a chest of this size will be more than adequate for most carvers needs. of the posts rebated to produce flush interior walls. The appearance is enhanced by the addition of thin 4mm rails glued to the solid timber sides. After assembly these thin rails along with the corner posts produce the illusion of a more decorative frame and panel construction. 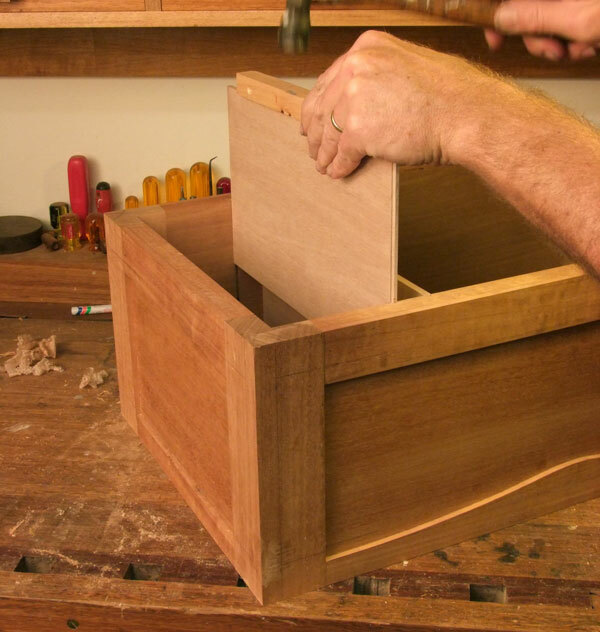 The lid of the chest consists of a mitred frame with more decorative panel work. 1. The top rail of the box front was shaped to add enough depth to take an escutcheon for the box lock. Machine the sides, posts and thin rails to rough dimensions and glue the 4mm rails to the sides. I chose to give the top rail of the box front some shape to ensure it had enough depth to take an escutcheon for the box lock (photo 1). 2. After the rails were glued on, the posts were mortised with the domino jointer. With the rails glued in place reduce the assembled sides to their final dimensions and cut the joints for assembly to the posts (photo 2). 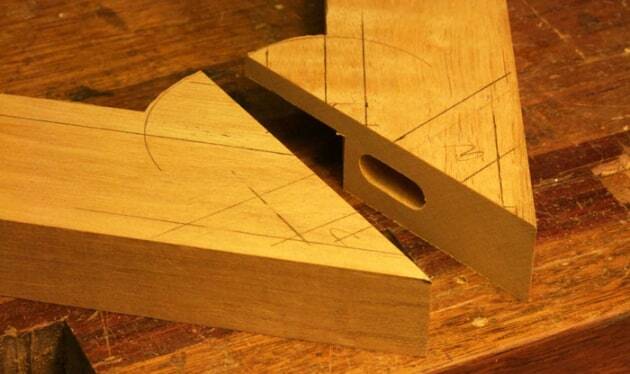 Dominos were used here, however, any similar method such as dowels or slip tenons would be equally effective. The joints should be cut to allow the posts to finish flush with the thin rails previously glued in place. You will find it much easier cut the joints on the posts prior to rebating the inside corners on the tablesaw. Any grooves required to take internal dividers should be cut ahead of the glue up which needs to be done in stages. 3. 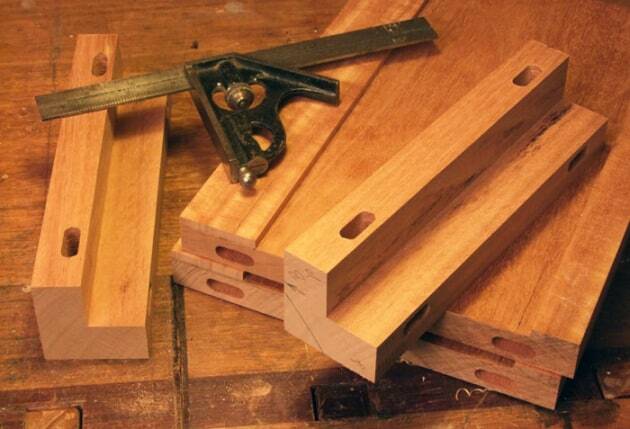 Use packers to even the pressure when gluing the posts to the long sides. Firstly, the posts are glued to the two long sides. With the corners of the posts removed, you will find it useful to use thin packers between your work and the clamps to ensure no racking occurs when pressure is applied (photo 3). Finally the two assembled long sides can be glued to the short sides to complete the box. 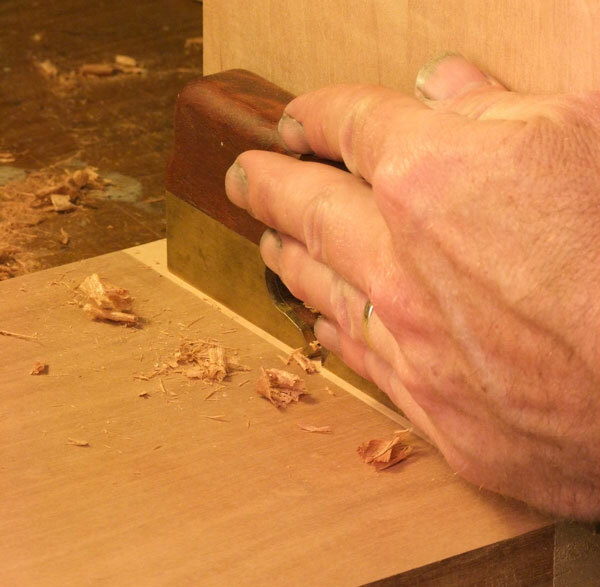 It’s crucial to check for square during glue-up or you’ll be left with the task of fitting out of square trays to the internals at a later stage. 4. Nailing 4mm decorative beads to decorate the panels. On removal from the clamps the external surfaces of the box can be cleaned up before nailing small 4mm beads in place to decorate the panels (photo 4). 5. Flushing the corner post rebates. 6. After sanding the rebates, internal dividers are fitted. ...ahead of sanding the internal surfaces and fitting the internal dividers into the routed grooves from below (photo 6). 7. After the ply base is fitted, the corners are sawn off on the tablesaw. To complete the box, a plywood base is glued and nailed into position before the external corners of the posts are removed on the tablesaw (photo 7). Finally, decorative mouldings are applied to hide the edge of the plywood base. A mitred frame and panel construction was chosen for the lid to allow for the rounding over of the internal corners of the frame to match a decorative oval panel (fig.3). The oval panel and rounded corners adds considerable challenge to the project and can easily be substituted for a much simpler rectangular frame and panel if desired. 8. Rough out the rounded corners on the frame components on the bandsaw before cutting rebates for the internal panels. With the mitres cut, rough out the rounded corners on each of the four frame members on the bandsaw and cut the rebates to take the internal panels (photo 8). 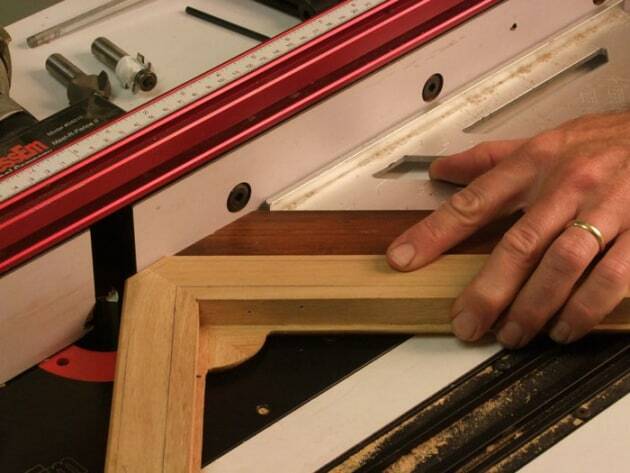 Whatever joint you choose for the mitred frame, be sure to leave enough space on the outside edge to cut the moulding so that the joint isn’t exposed. 9. 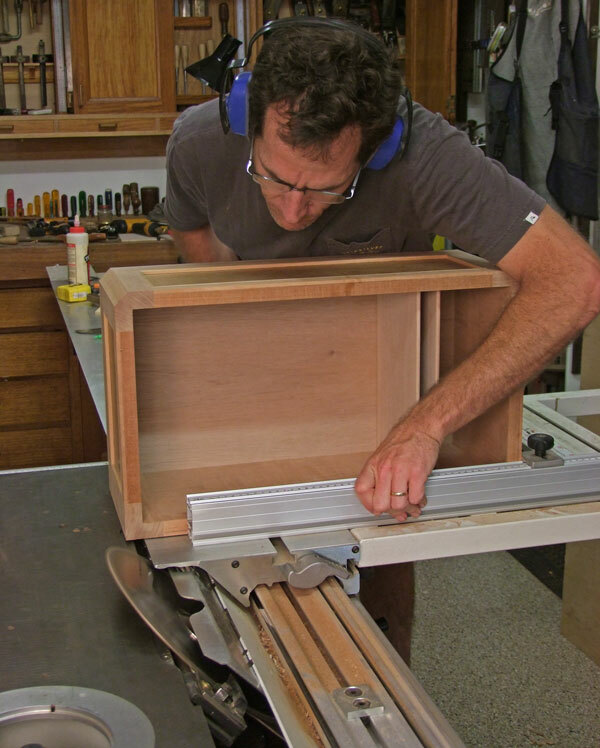 Support the frame when routing the lid corners. 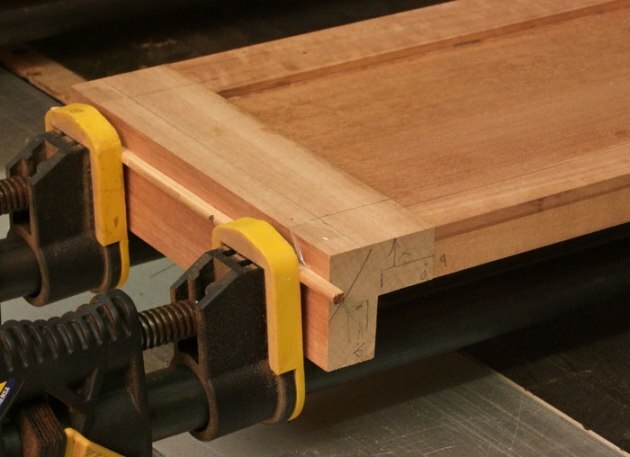 Remove the outside corners of the frame to match the canted corners of the box and prepare the frame for routing the outside edge on the router table. 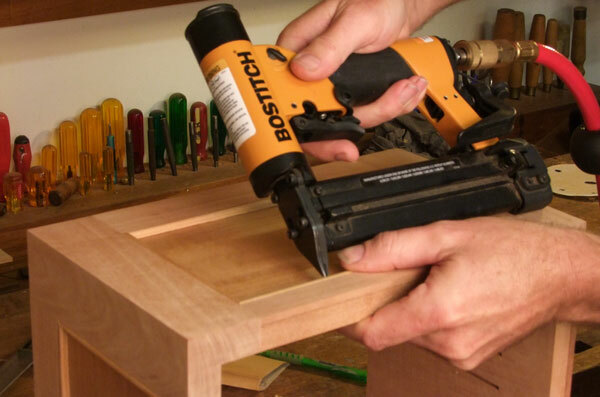 You will need to ensure that additional support is provided to the frame whilst routing the short relieved corners of the lid as shown in photo 9. 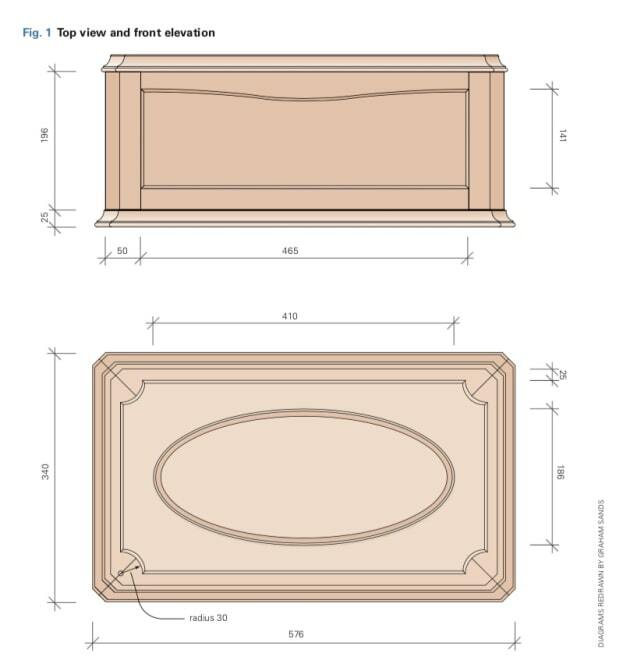 The inclusion of an oval opening to the panel and rounded corners on the lid frame adds to the traditional styling of the piece and requires a pair of templates to be made to complete the moulded openings. 10. Square up the rounded corners with a gouge. With a template made for the internal opening of the frame a bearing guided cove bit can be used to cut the internal frame moulding. You will be left with a rounded profile to the internal corners that will require squaring up with a gouge (photo 10). 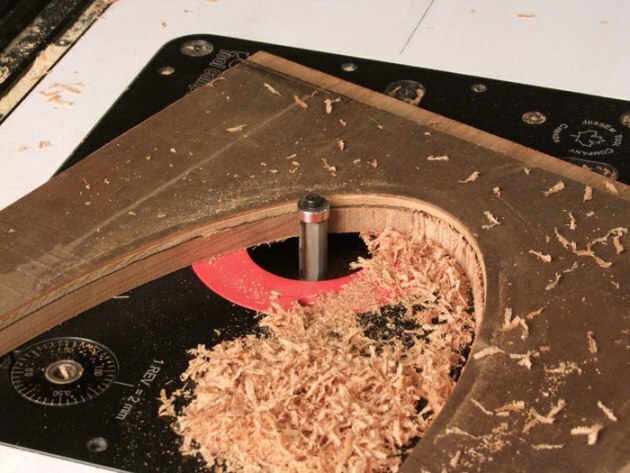 To complete the oval opening in the top panel, mark up the desired shape on both the panel and an identical plywood template and rough out the oval section on both pieces with a jigsaw or fretsaw. 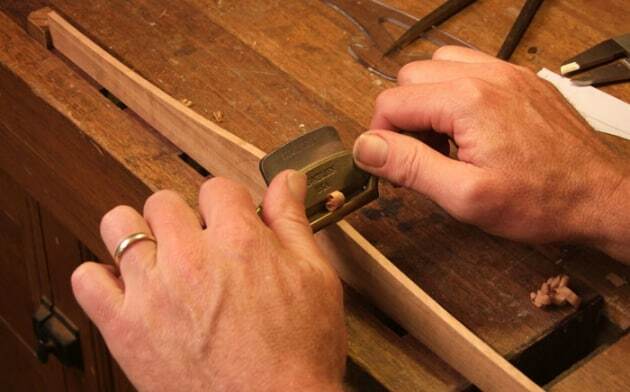 Smooth the oval edge of the plywood template with a spokeshave and sand smooth. The success of the final panel is entirely dependent on the smooth lines of the template so persevere until you have a smooth continuous curve. 11. 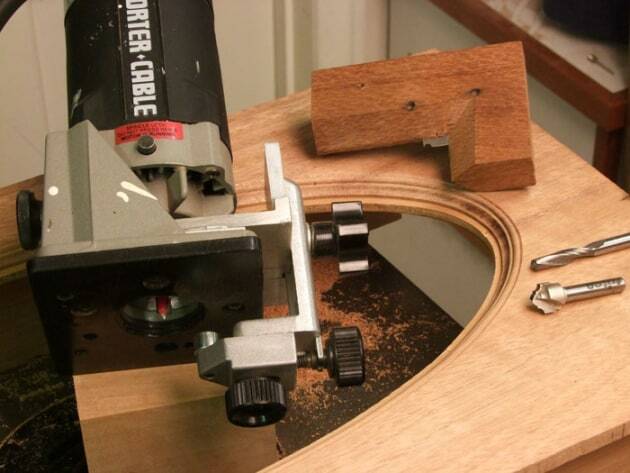 Routing the oval template with a pattern following bit. Nail the template to the panel and with a bearing guided trim bit fitted to the router follow the template to replicate the oval shape on the panel (photo 11). 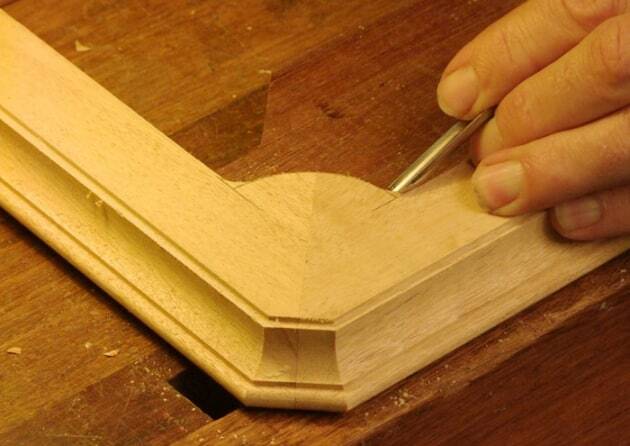 Repeat the procedure with small router bits to produce a nicely moulded edge. 12. Tools for profiling inner moulding edge: scratchstock, router bits, trim router base. I also chose to add a tiny bead to the upper inner edge of the moulding with a scratchstock. The tools involved including scratchstock, router bits and a modified base for my trim router to allow profile routing are shown in photo 12. With the routing complete you will need to do some cleaning up with fine sandpaper, particularly in the quadrants where the routing direction travels against the grain. Take your time with this to ensure you don’t round over the sharpness of the moulded edge. 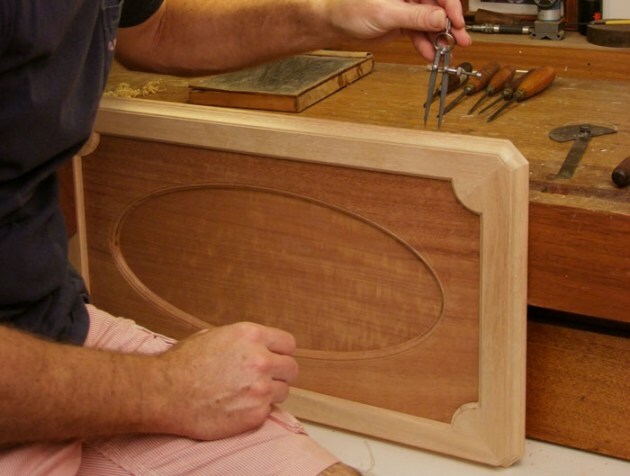 With the clean up complete, a suitable small beaded moulding can be cut to size and nailed in position on the underside of the lid to support both the oval upper panel and the full panel beneath. It seemed only appropriate that a chest for carving tools should carry at least some carved decoration. When decorating pieces like this I strongly believe that less is more and as such chose to restrict the carved decoration to some simple ropework detail worked on the mouldings. 13. Dividers will ensure accurate spacings as required for fine detailing. The tools and process involved in producing detail like this are very simple with my suggested minimum tools including a fine #11 gouge (11/3), small V tool (12/3) and a set of dividers. Layout is critical with fine carved work like this so be sure to use dividers to guarantee accurate spacing (photo 13). 14. Finishing off the bead with #11 gouge and V-tool. The decoration is completed by carving across the bead at approximately 45° with the #11 before finishing off with two or three very fine scores to the surface of the bead with the V tool. The work being progressed is shown in photo 14. 15. With the carcase completed, now work on the interior can commence. In the next part of this article we will take a close look at fitting the half mortise lock in addition to completing the internal fitout of the chest with custom tool trays. 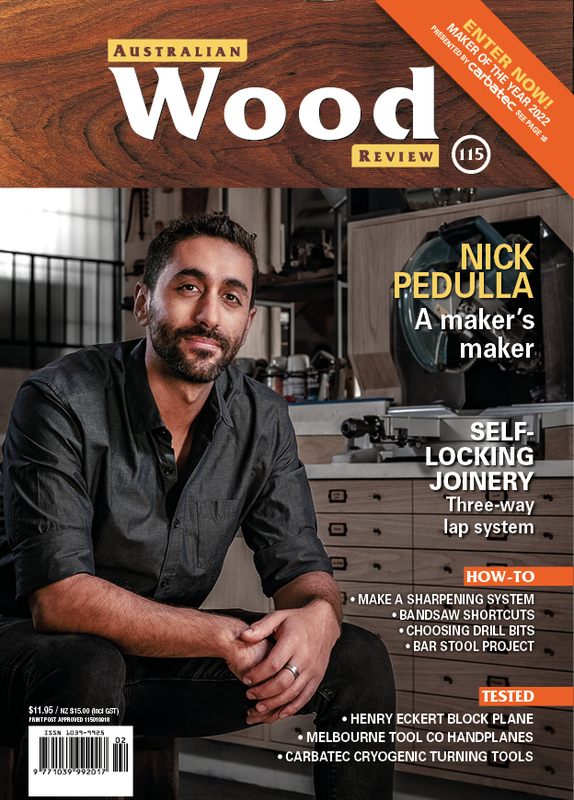 Troy McDonald is an engineer and woodworker based in Brisbane who writes regularly for Australian Wood Review magazine.